Coordinated approach to addressing criminal and regulatory risks and providing sound strategies for defense and mitigation. Today’s clients face increasing criminal and regulatory risks. Calfee’s White-Collar Investigations and Litigation practice offers a coordinated approach to addressing those risks and providing sound strategies for defense and mitigation in times of urgency and stress. Whether parallel civil and criminal actions, internal or external investigations, additional regulatory oversight, disclosure requirements, governance and compliance issues, insurance coverage, crisis management or business judgment, Calfee’s White-Collar Defense team has the experience and judgment to provide constructive counsel no matter where the process leads. Led by attorneys who have spearheaded defensive investigations and responses throughout their careers, the team also includes both securities and governance attorneys with experience representing businesses, issuers, underwriters, shareholder groups, directors and officers and public bodies, as well as trial lawyers experienced in complex, bet-the-bank civil litigation and criminal trials. 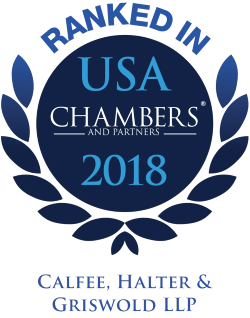 Calfee's Litigation practice was selected for inclusion in the 2019 "Best Law Firms" rankings by U.S.News –Best Lawyers in America in several areas. Defending accounting executive of publicly traded company in SEC and class action securities fraud litigation. Defend privately held company in public corruption and conflicts of interest investigation. Defend publicly traded company in DOJ and SEC securities fraud investigation in Washington, D.C. and Northern District of Illinois. Defended a felony trade secret theft prosecution in the Eastern District of Michigan. Represent medical company in DOJ investigation regarding False Claims Act issues. Review and revise corporate policies and procedures regarding FCPA, export and other compliance issues. Designed individualized risk assessments and training for publicly traded companies in Foreign Corrupt Practices Act, False Claims Act. Represent public institutions victimized by public officials’ corruption activities. Conducted internal investigation of revenue recognition and other accounting practices for privately held high-tech company. Represented a major financial institution in investigation by a self-regulatory organization relating to compliance and conflict of interest issues. Represented a director of the New York Stock Exchange in litigation involving the New York Attorney General’s investigation into the compensation of the Exchange’s former President, Richard Grasso. Represented a major financial institution advisor to a mutual fund complex in connection with the SEC’s investigation of alleged industry kickbacks. Represented a publicly traded company in an internal investigation of fraud committed by officers of a foreign subsidiary that resulted in the restatement of several years of audited financial statements and in related enforcement proceedings brought by the SEC and Australian securities authorities. Represented a major financial institution in an internal investigation into possible late trading and market timing activities in mutual funds and in related investigations by the SEC, the New York Attorney General, the Illinois Attorney General and the NASD. Conducted internal investigation of possible conflict of interest and other Food and Drug Administration violations for a health care institution. Defended an international manufacturer of automotive tires in connection with a national criminal antitrust price-fixing investigation. Represented one of the largest, domestic, privately owned manufacturers and distributors in its industry with respect to a variety of governance and operating issues involved in a nationwide investigation by the Bureau of Alcohol, Tobacco, Firearms and Explosives and the U.S. Attorney’s office, resulting in resolution of all issues without litigation, without material immediate or long-term detriment to the business, and without officer or director exposure or penalties. Represented a privately held company in investigation and recovery for the fraudulent kickback and invoicing scheme of a sales manager and major vendor. Represented a special committee of a publicly traded company in investigating related party transactions involving the company and entities affiliated with the former CEO. Represented a large urban hospital in a False Claims Act settlement with the federal government concerning insurance reimbursement for monitored sleep studies. Represented a consulting company and its principal accused of fraud in claiming cost reimbursement for environmental investigations and remediation. Represented a special committee of a large manufacturing company regarding allegations of diversion of corporate funds and waste of corporate assets by officers and shareholders. Defended clients in criminal antitrust investigations of alleged bid rigging in the dairy, scrap metal and electrical contracting industries. Served as special counsel to the Ohio Attorney General in an investigation of fraud by executives at one of the nation’s largest private medical malpractice insurance carriers, in its subsequent liquidation and in litigation against executives involved in the fraud. Represented a large manufacturer and distributor of products in a variety of investigation, governance, settlement and litigation related matters with respect to agency enforcement proceedings, class action litigation and multiple class action opt-out proceedings involving alleged price fixing, market allocation and related trade regulation violations, culminating in successful resolution of all claims and continuation of the client’s business on a financially and operationally sound basis. Represented a multi-state processor of food product in investigation of and recovery for an embezzlement scheme by the chief financial officer. Defended a major manufacturer of steel containers in a criminal antitrust investigation of allegations of price fixing and market allocation. Represented a public company in investigation of and recovery for fraudulent invoicing and embezzlement scheme by a claims department manager. Represented a state agency in federal road construction disputes, including assistance to federal prosecutors who obtained fraud convictions resulting in orders of restitution for the client, as well as civil litigation resulting in damage awards for fraud and breach of contract. Negotiated a plea agreement on behalf of a corporation accused of Clean Water Act violations. Represented a Brazilian subsidiary of a public company in investigation of and recovery for fraudulent financial reporting and embezzlement by the subsidiary’s officer. Represented individual officers and directors in corporate and regulatory investigations involving multiple national companies. Defend individuals in federal tax, bankruptcy, trade secrets theft, ERISA and health care fraud prosecutions and investigations. Many clients choose to minimize risks by implementing governance and compliance initiatives such as periodic risk assessments, compliance and process investigations, policy and coverage audits, and similar initiatives. Calfee’s attorneys have a long record of assisting clients in developing these initiatives – for example, in FCPA and health care – and in using the results when necessary in the subsequent defense of regulatory, civil and criminal proceedings. Clients also have to respond when the government or others raise threats of civil, regulatory or criminal actions. Calfee regularly counsels boards, board committees and businesspeople in addressing all aspects of such scrutiny, including regulatory and criminal inquiries, internal investigations, criminal and civil trials, insurance coverage disputes, conflict and privilege issues, and agency cooperation considerations. We draw on this experience to help our clients navigate the risks and arrive at the best possible outcome for the ongoing success of the business or the individual. A Midwest firm with extensive and established national practices in highly regulated industries and activities, Calfee is efficient, cost-effective, disciplined in its approach and focused on the long-term health, continuing success, and financial security of our clients' businesses.